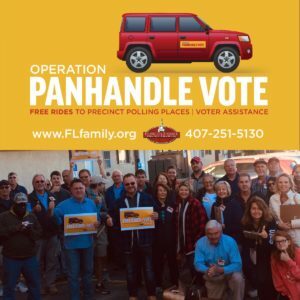 From Thursday, November 1, 2018 to Tuesday, November 6, over 65 patriots from across Florida drove to Panama City in Bay County, Florida to canvass a list of 26,000 voters over five days in the hurricane-ravaged regions of the Florida Panhandle. 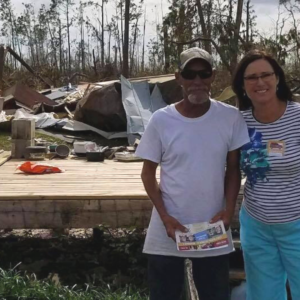 This was like part short-term missions’ trip, part disaster recovery effort and part political door to door canvassing, but it was truly one of the most amazing projects we ever had the privilege of being part of. Each vehicle had a bright FREE RIDE TO THE POLLS signs and teams went out two by two to cover streets more efficiently. 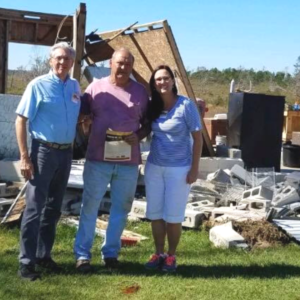 Our teams prayed with hundreds of voters on their doorsteps, outside on front lawns and amid devastation to their own personal property. Many tears were shed. There were so many stories of the people who were grateful that a person cared enough to drive all the way up to the Panhandle area to remind them to vote. We gave out special polling place fliers, voter guides, bottles of water and snacks. Several voters who had transportation issues also accepted rides directly to the polls on the spot. We also ran a highly targeted Facebook and Instagram ad campaign to identify and communicate with the thousands of people who were displaced and living outside their homes in hotels, friend’s houses and shelters. Calls for voter information and requests for rides to the polls were then routed to our office and then delivered directly to the teams on the ground. We also recorded and delivered automated call which was also sent to thousands of voters in the region who had not voted yet letting them know about the upcoming election and where they could call to get voter information or a ride to the polls. Our team of workers were some of the finest, most dedicated folks I have ever met. They included pastors, veterans, teenagers, seniors, missionaries, mothers and fathers with their children and even a bank president! All who signed up loved God, loved their country and wanted to see every person effected by the storm to have the opportunity to vote. They worked in the cold, they worked in the rain, they worked in the dark, and they worked up to 10 hours a day. 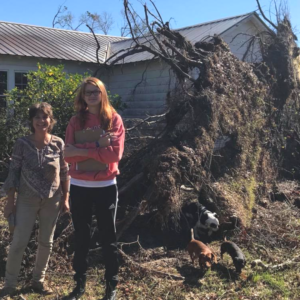 They climbed over fallen trees, walked around damaged buildings, and even though the workers were all given Sunday morning off, many refused the personal time and just continued to work. The effort went largely unnoticed by the mainstream media. Newsmax, a conservative news blog did a nice write up (see below) with details on the event. This was a unique and strategic moment in history which we had the privilege of being part of and was only made possible by your prayers, your financial support and for your direct participation. Thank you so much. We are grateful to God for you and for the final results of this extremely close election. Finally, we are grateful to God for you and the remarkable RESULTS we have been able to accomplish in this and in so many other areas with your prayers, financial support and by just being willing to stand with us in heart and mind. Thank you, thank you, thank you. We pray you have a peaceful and joy filled Thanksgiving with family and friends. © 2018 Newsmax. All rights reserved. Read the originally published article at Newsmax.com here.